Matthew Saroff: "We are Unbelievably Screwed"
History will be unkind to Alan Greenspan. He inflated the dotcom bubble, he inflated the housing bubble, and he sat on the commission that "fixed" social security, and then spent his time trying to destroy it. 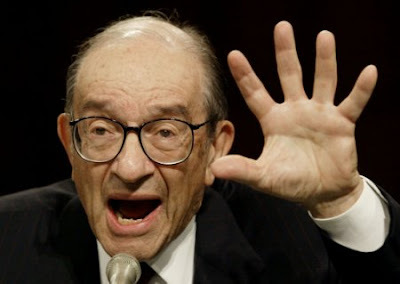 This disciple of Ayn Rand has directed the most powerful monopoly on earth for many years, the Federal Reserve, and he has driven the US and the world economies over a cliff of arbitrage. Since late 2003, on a message board founded by former Netslaves refugees, I have been discussing the position of the dollar with regard to the world's 2nd reserve currency, the Euro, and its consequences on the US economy. My thesis, staked out in the middle of the housing boom, was that unsustainably low interest rates were driving house prices to unreasonable levels, because people buy on monthly payment, not price, and the emergence of downward pressure on the dollar from the Euro would cause a drop in the US dollar, a spike in interest rates, a collapse in the housing market, runaway inflation, and an extremely severe recession. The threat to the Dollar from the Euro is very straight forward. It is the only viable alternative reserve currency to the dollar. A reserve, or anchor, currency is, to quote Wiki, "A currency which is held in significant quantities by many governments and institutions as part of their foreign exchange reserves." It's where governments, transnational corporations, and NGOs "park" their money for when they need it. Since the end of the second world war, the USD has been THE reserve currency for the world. This has meant that billions of dollars a year, and trillions of dollars over this period, have flowed into the United States as a result, and are invested in government bonds, equities, and other investments. Through the laws of supply and demand, this has the effect of increasing the value of the dollar, increasing the value of investments, and driving down interest rates in the United states. Since the creation of the Euro, it has emerged as a viable alternative reserve currency, because the Euro zone is big enough, and diverse enough to provide a many options that are demanded of a reserve currency.